Find information on the various forms of fraud and how consumers can protect themselves. Checking your credit report does not harm your credit score. When you check your credit report, you should look for accounts that you don’t recognize. For example, if you see that there is an open account with VISA and you don’t have a VISA credit card, that may be an indication that someone has used your identity to open a credit card. Email Bowater Credit Union at info@bowaterecu.org. We may post the information so that other members do not fall victim. Use these links to investigate current phishing attempts, identity theft schemes, “work from home” claims, email forwards you receive, and other suspicious claims. Several members have reported receiving calls to their cell phone from someone who claims to be with Microsoft. The scammers are asking the victims to agree to charges. These calls are not from Microsoft, they are scammers attempting to gain personal information such as card numbers, passwords, or social security numbers. If you have given them your debit or credit card number, call our Card Services Department at 423-336-7268 to be issued a new card. If you have given them your myBRANCH password, please call our myBRANCH team at 423-336-7268 to have your password reset. If you have given them your Social Security Number, you will want to check your credit and put a freeze on your credit report with the three major bureaus. Here is more information about how to proceed if you’ve compromised your SSN. A member who is part of several Christian Facebook Groups was targeted through Facebook by someone claiming to be a pastor of a church. The pastor claimed to have raised money for a mission charity in Nigeria, and the Pastor sent a check to the member and asked that the member wire part of the money to the charity in Nigeria, and the rest she could keep as a blessing to herself. The member deposited the check. A hold was placed on the check, but once the hold was gone the member wired the funds as instructed. The check that the member deposited from the “pastor” turned out to be fake, and the member was unable to retrieve the money wired. The Tennessee Department of Financial Institutions issued a warning to all credit unions that scammers out of New York are running a scam on Tennessee residents that references specific Tennessee credit unions and requests account information over the phone or via a fake web link. Members have reported receiving texts regarding a “Debit Card Alert” that requests personal information, including your card number, expiration, and PIN. This is a scam, please ignore the text. Members received checks for this too-good-to-be-true scam, which at its core resembles the “Consumer Promotion Draw” scam detailed below. “Congratulations, I am happy to inform you that you have successfully been entered into the program. An expert, who will meet you has been allocated to install the decals on your car. You will, therefore, receive your payment alongside the money that will be paid to the national car detailer(expert) in the mail. So when you get the payment, you will take out your first week pay of $400 and give the rest to the detailer. This is to afford mutual relationship between you and the detailer. A check of $1850.75 would be mailed to you to cover your money and the detailer’s money. In view of this, please confirm the following details; How long do you intend to carry the advertisement on your car? One(1) month, two(2) months or three(3) months? Do you use your car everyday? Also reconfirm your name and address as it should be on the check, where your payment should be mailed. The members received another email letting them know the check was mailed, and then the check as promised, and brought it to the credit union to see if it was legitimate. Our Member Service staff called the financial institution the check was drawn on and learned that the account listed on the check did not exist. The scammers are trying to get people to deposit the check in their account, and then once it clears they have the member keep $400 and give the rest of the cash to the “detailer”. But just because a check is made available to you by your financial institution does not mean the check is good. It can sometimes take weeks to attempt to get the money from a check. Then, when the financial institution determines the check is no good, the member has already handed cash over to a stranger, and it’s gone. How can you avoid being a victim of scams like this? Go by this rule: if it sounds too good to be true, it probably is. Another text scam is circulating in our area. People are receiving text messages that say “CREDIT UNION MOBILE BANK ALERT: your VISA CARD has been temporarily DEACTIVATED. Please call our 24 hrs line” The text message also gives a phone number to call. These texts are a scam. They have been sent to any cell phone the scammers can get their hands on, not just credit union members. Their hope is that they will reach some people who are members of a credit union, and that some of those people will fall for it and call the number. If you call the number, you are asked to enter personal information. If you receive one of these texts, ignore it. If you have responded to the text and called the number, please contact your financial institution immediately. A member received a phone call from a man who claimed that he was going to be sending him (the member) a new Medicare Card. He asked the member to verify his name and address (which the caller had), and then started asking him to verify his account number, at which point the member hung up. The member called the Social Security Office and they confirmed they didn’t have anyone making those calls. It’s unclear what the criminal was after, but it was most likely personal information such as account numbers and a social security number. As always, if you are suspicious about a call you receive do what this member did: hang up and call someone related to the incident at a number you know (The member quickly called the SS Office, and then his credit union). A scam that is popular right now are fake order scams. 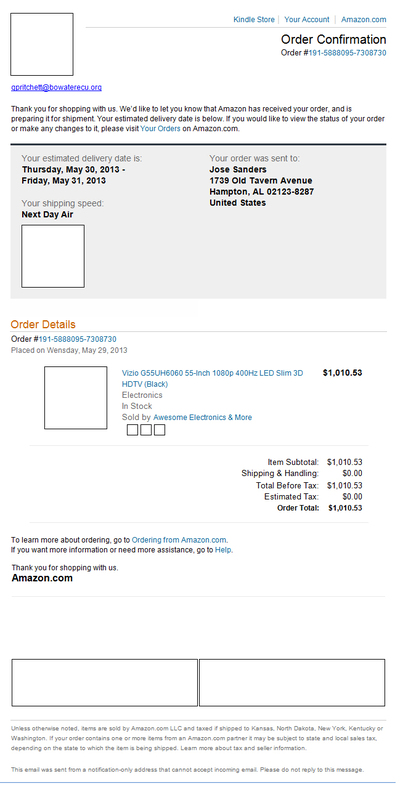 Several members have received emails recently that appear to be order confirmations for expensive items from amazon.com or walmart.com. The emails are fake – there is no order. 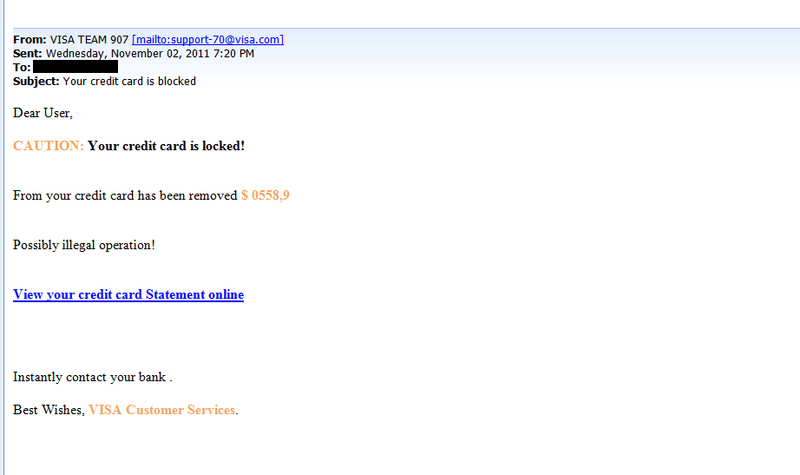 The scammers are hoping you will click on any link in the email. Clicking may download malicious software to your computer, or it may just guide you to a page that asks you for personal information like a credit card number (or both). If you receive and email like this, ignore it or delete it. If you’ve responded to an email like this by clicking on links, have your computer examined for malware and contact your financial institution. Click here to see an example email that the CFO of Bowater Credit Union received. On Sunday evening many area residents (members and non-members) received a text that said “BOWATERE CU ALERT: Your CARD has been DEACTIVATED. Please call 423-709-8307”. If you called the number an automated message asked for your card number. If you entered that, the message asked for your PIN number. These text messages were not sent by Bowater Employees Credit Union. In addition, the credit union’s information was not compromised in any way – the scammers got a list of cell phone numbers in our area and simply used our name (albeit misspelled) hoping they would send the message to some members who had cards with us. If you receive a call, text, email, or other communication that claims to be from your financial institution and asks for personal information (for example: card number, account number, social security number, online account access IDs & passwords), call your financial institution at a number you know to verify. Do not call a number or click a link given in the communication. As per an alert we received from FICO, scam artists are once again sending phishing texts to trick cardholders into giving away their information. At this time the targets appear to be in Georgia. Fraudsters are texting consumers with a message that their payment card has been frozen. A BIN number (the first six digits of any card number – it indicates the bank or credit union the card is for) followed by “XXXX” is being used to portray the message as an official looking communication containing a truncated payment card number. If you receive a text that is claiming to be from your financial institution, do not call the number given in the text. Call your financial institution directly at a number you know. Subject: Your Olympic Team Tickets Order Has Been Completed! We are delighted to inform you that your the Tickets shown below (and also reflected in your USOC customer account ) have now been reserved for your exclusive benefit. You have a 12 hour time limit to dispute the charge using the online form by clicking on the Dispute button to the left of the invoice page. The USOC will process your payment based upon the payment information you have provided during your application for Tickets. This email is a phishing scam. They hope that any recipients will say “I didn’t order olympic tickets! I better dispute this charge” and click the link. Clicking the link may install malware on your computer, or it may lead you to a site that asks for your personal and account information, or it may do both. Do not click on any links or respond to any emails you believe to be suspicious. If you receive any information about charges to your cards or accounts that were not done by you, call your financial insitution first, at a number you know. Bowater Credit Union has become aware of a sophisticated phishing scheme that generates a popup message while users are logged into online banking. The popup message appears to be from Bowater Credit Union (or other legitimate financial institutions) and offers to get your free credit report. During the process you are asked for a credit card number. You will recieve your credit report, but the fine print lets you know that you are also signing up for a subscription service that will charge you $29.95 per month. The fine print also notes that the service is NOT affiliated with Bowater Credit Union (or other legitimate financial institutions). Similar schemes might also ask for personal information such as login names, passwords, social security numbers, etc. The popup message includes a reference to “Bowaterecu.org,” making it seem more credible. If you are at all uncertain about the legitimacy of a Bowater Credit Union Web page or window please contact us directly by phone for verification. If such a popup appears we recommend that you ignore any actions that the popup recommends and close the window immediately. If you are logged into online banking we recommend that you log out of online banking, close all browser windows, then restart a single browser window to access online banking again. This most recent scheme utilizes a technique called “in-session phishing .” A vulnerability exists in all major Web browsers that allows data to be exchanged between open browser windows. If a user has an active myBRANCH online banking session open in one browser window and is viewing a Web site in a second browser window, code running on the second site can detect the myBRANCH session taking place in the first window. The malicious code identifies the session with myBRANCH and then generates a popup window customized to read that it comes from “Bowater Employees Credit Union.” The malicious code generated by the second Web site is not permanently installed on the user’s computer, so antivirus and antimalware software are not likely to detect it. Bowater Credit Union recommends that when you are logged in to any online banking system that you close all other browser windows and tabs. Once you have successfully logged out of myBRANCH you can resume visiting other Web sites. A member recently reported receiving several phishing calls from the phone numbers 888-777-5544 and 360-210-3456. The caller speaks quickly and says that they are from “Global Rewards” and that the member has won a $100 gift card for using their VISA credit card. They have the last four digits of the intended victims credit card number and say they just need to confirm the full card number and address so the intended victim can receive their gift card. The BECU member recognized it as a scam and hung up. Unfortunately these scammers continue to call, saying the same thing. The member has asked them to stop calling, but so far they continue to call. This is a scam; they are seeking to gain the entire credit card number. These calls are being received by VISA and Mastercard holders nationwide. We don’t know how they are getting the names, phone numbers, and last four digits of a credit card. If you’ve received a call like this and gave them your entire card number, please notify BECU immediately. 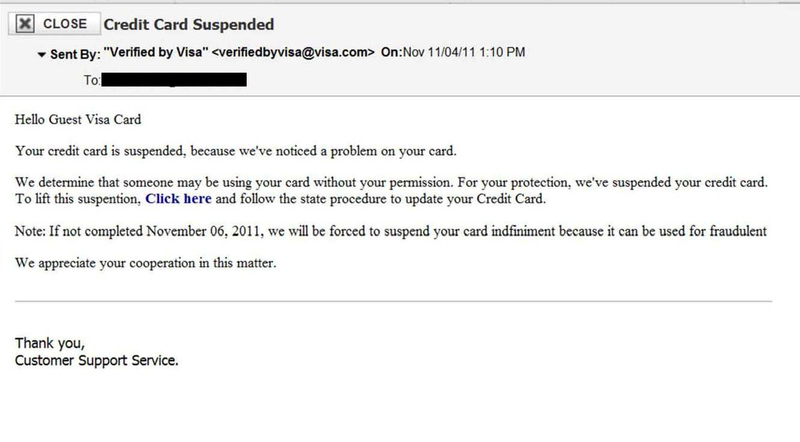 Two members have received emails that claim to be from VISA which state their VISA card has been “locked” or “suspended” for suspected fraud. These emails encourage the reader to click on a link in order to un-suspend the card, or view your credit card statement (presumabley to look for fraudulent activity). Clicking on the link will likely lead you to a fake website that asks for personal information like your credit card number or social security number. Clicking on the link might also install spyware or malware on your computer. If you receive emails like this, delete them immediately and do not click the links. If you have clicked the links but not entered any information, you may wish to have your computer scanned for viruses. If you have entered personal information, please call BECU and we’ll work with you to prevent fraud. People in our area are continuing to receive variations of the scam listed below (Text scam on Southeast Financial Credit Union). For several weeks now, many people in our area have received either a recorded message or a text that says their Southeast Financial Federal Credit Union debit card has been canceled or compromised, and then asks the individual to either “press 1” to speak to someone (in the case of the recorded message), or call a certain phone number (in the case of the texts.) If you follow through with either option, you will eventually be asked for your debit card number. This is a scam. The scammers are calling numbers at random hoping to trick someone into giving up their debit card number. Southeast Financial Federal Credit Union is a credit union located in Chattanooga, Athens, and Nashville, but the scammers will use any debit card number they get. How did they get the phone numbers? Most of it is completely random. Fraudsters will send out messages to ranges of phone number sequences. Literally millions of these messages could be sent out in one attempt. Is my information safe at Bowater Credit Union? If you received one of these messages, you should know that it is completely unrelated to your account at BECU. The calls are completely random and as long as you don’t give them your debit card number your accounts are safe. What if I DID give them my debit card number? Just call BECU at 423-336-7268. We’ll work with you to secure your account. Remember, whenever you get a suspicious call, email, text, etc., call BECU at a number you know is a BECU number (for example, any of the numbers listed on our “locations” page) and ask for more information. If the call was legitimate we’ll be able to fix the problem, and if the call wasn’t there will be no harm done. When the number is called, a recorded message thanks the caller for calling Southeast Financial Credit Union and asks the caller to enter their 16 digit credit card number. As posted on Southeast Financial CU’s website, this is a scam. Scammers have gotten cell phone numbers and are texting people at random with the hope of tricking those who actually have a SECU credit card. Many cards (possibly all cards) from SECU start with the four digits “4701”, it is the digits that follow and especially the last four that will be unique. If you receive a text like this, or ANY text or phone call that you are not sure is legitimate, always call BECU directly for more information. A member recently received a text message which stated “Alert! Your credit score has recently changed. Go to www.123newscore.com to see your updated score for free.” The text came from 44847. This isn’t a case of fraud or ID theft – it’s just a case of misleading spam. There’s no telling how the company got the member’s cell phone number, but the company is not monitoring the member’s credit score and alerting them to a significant change. They can say that “your credit score has recently changed” because credit scores are always changing. Every day that you are not late on any payments your score goes up, and every day that you are delinquent on anything your score goes down. So it appears that 123newscore.com is sending that message to lots of cell phones trying to drive potential customers to their site. 1) Get your free credit report every year (actually 3 times a year, since you get a free annual one from three different credit bureaus). Go to http://www.annualcreditreport.com/ to get it. 2) Don’t pay for your score. Your report should be enough to give you an idea of where to improve (and if it doesn’t, call BECU, we’ll help you read your report and give you pointers about where to improve.) To get your score, just ask the loan officer when you apply for a loan, they’ll tell you. 3) If you’d like a credit monitoring service, research your options. There are many services out there that offer different options. Some place fraud alerts on your credit file, which is something you can do for free. Some have an insurance policy that repays you for expenses in the event your identity is stolen. BECU offers one called AlertMe for just $4.25 a month. AlertMe monitors your Experian credit file and lets you know of any changes, and also has an insurance policy. A BECU member received a phone call from a man who claimed that the member’s grandson was in jail in Haiti, and that he needed $59 for bail. The caller never called the member by name, only calling her “Grandma” throughout the call. The BECU member asked the caller to have the grandson tell her something that only members of the family would know, at which point the caller hung up. The member’s caller ID did not show any number. Then the scammer would claim to be in jail, or have been in a car accident, or in some other form of trouble that required the victim to wire them money. And the scammer would of course ask the victim to please not tell their parents so they wouldn’t be in trouble. For more on this scam visit the website of http://www.consumeraffairs.com/news04/2006/11/grandparents_scam.html. Your best defense against this scam is to be aware of it, and always be 100% sure of the identity of the person you are wiring money to. Know that once you wire money, it is gone and untraceable. A BECU member received a letter from “Goldlink Securities Inc.”, along with a cashier’s check drawn on Chase Bank, that said he was “one of the declared winners of AMERICAN AND LONDON SHOPPERS SWEEPSTAKES LOTTERY”, and that he was entitled to the sum of $125,000.000. The enclosed check for $3,975 was supposed to be deducted from his winnings for the purpose of paying “government taxes”. The actual tax amount is said to be $2,975, which should be paid through Western Union directly to the “tax agent.” The letter includes contact information for a “claims agent” who will provide further instructions. The BECU member recognized the scam and kindly brought the letter and check into the credit union for us to use for educational purposes. This scam works exactly like the “Consumer Promotion Draw” scam explained below: The victim calls the “claim agent” as instructed in the letter. The claim agent tells the victim to deposit the check into their account, and then wire the “tax amount” using instructions they provide. The victim will deposit the check and wire the money, and by the time the financial institution tries to draw on the check and discovers that it is fake, the wired money is already gone from the account. In the example of this letter, the member would be out $2,975 because the $3,975 was never really there. To see larger images of the check and letter, just click on the thumbnails. A member received a letter from “Trustnet” informing the receiver that they are a winner in the “North America Consumer Promotion Draw.” The letter said they were entitled to a sum of $24,620.00, and a check for $985.18 was included with the letter. The letter gives a phone number to call to speak with their personal “claim agent.” The letter also informs the recipient that the tax amount for the winnings is $820.00. The member was wise enough to see this for the scam it is and did not respond. Here is how the scam works: The victim calls the “claim agent” as instructed in the letter. The claim agent tells the victim to deposit the check into their account, and then wire the “tax amount” using instructions they provide. The victim will deposit the check and wire the money, and by the time the financial institution tries to draw on the check and discovers that it is fake, the wired money is already gone from the account. In the example of this letter, the member would be out $820.00 because the $985.18 was never really there. This one is pretty slick since they provide YOU with all the information, except the one piece they want. Note, the callers do not ask for your card number; they already have it. Caller: ‘This is (name), and I’m calling from the Security and Fraud Department at VISA. My Badge number is 12460. Your card has been flagged for an unusual purchase pattern, and I’m calling to verify. This would be on your VISA card which was issued by (name of financial institution). Did you purchase an Anti-Telemarketing Device for $497.99 from a Marketing company based in (some state)? Here’s the important part on how the scam works: The caller then says, ‘I need to verify you are in possession of your card’. He’ll ask you to ‘turn your card over and look for some numbers. There are 7 numbers; the first 4 are part of your card number, the next 3 are the security Numbers that verify you are the possessor of the card. These are the numbers you sometimes use to make Internet purchases to prove you have the card. The caller will ask you to read the 3 numbers to him. After you tell the caller the 3 numbers, he’ll say, ‘That is correct, I just needed to verify that the card has not been lost or stolen, and that you still have your card. Do you have any other questions?’ After you say No, the caller then thanks you and states, ‘Don’t hesitate to call back if you do, and hangs up. You actually say very little, and they never ask for or tell you the Card number. What the scammers want is the 3-digit number on the back of the card. Don’t give it to them. Instead, tell them you’ll call VISA,Mastercard, or your financial institution directly for verification of their conversation. It’s always a good idea to be cautious when buying and selling over the internet. Please see the image below to see the bogus check and envelope the member received. A BECU member recently fell victim to a “Verification” phishing scam. A caller identified themselves as being with the “Nationwide Verification Office” and claimed to be working for the government. The caller told the member that her accounts may have been compromised and posted on the internet, and they needed to verify her account information to take care of the problem. A BECU member recently received a fictitious check drawn off “State Bank of Cross Plains”. This check is drawn off a fictitious account titled Primera Trust, LTD, and it is part of a scam from Canada. People are receiving letters saying they have won $45,000 and enclosed is a check for a portion of the “winnings.” In the letter, they are instructed to call a number to authorize the enclosed check and obtain information for processing of the next check. On this phone call, recipients are asked to give their account number for deposit of their “winnings”. A BECU member received a text message that said their account had experienced unusual activity, and it requested the member call a phone number to give them account information. The member used myBranch to verify that there was no unusual activity on their account and ignored the text. A BECU Member recently received a phone call from someone who stated they were “calling about her Bowater Employees Credit Union account”. They claimed that $700 had been removed from her account, and that they were trying to help her get her money back. They asked for her account number, and balance information. The member asked who they were and all they would say is that “they were just trying to help her”. The member hung up and called to let us know. This person was not from BECU – it was a criminal attempting to obtain account information. Should you receive a call like this, DO NOT give the caller your account number. BECU will never ask for your account number over the phone or in an email. If a member of BECU staff needs to verify your identity over the phone we may ask for a social security number, phone number, address, password, or other identifier. A member of BECU received an email claiming to be from the NCUA (National Credit Union Administration). It informed him that his card had had unusal activity and it needed him to verify information or the card would be put on hold. There is an email in the link which takes the reader to an unsecure site that asks for personal information including card number, PIN number, Social Security Number, and other information. If you receive this email DO NOT enter your information. For more information about fraudulent emails claiming to be from the NCUA, click here. BECU will never email you a request for account information, PIN numbers, or other personal information. 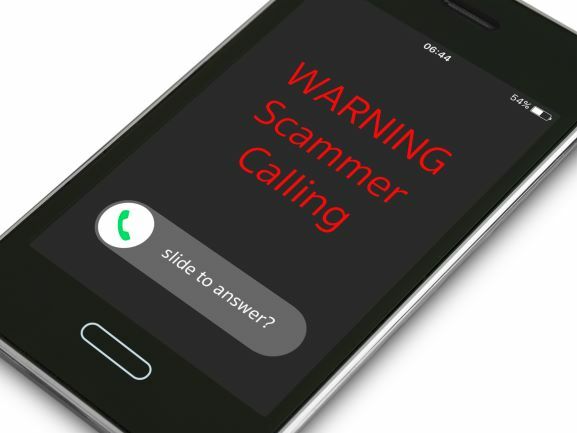 If you think you have fallen victim to this type of scam, please call BECU immediately. Recently a member of BECU received a phone call from a man claiming to be a Vice President of Bowater Employees Credit Union. The man told the member that someone had stolen $300 from her account, and that he needed her account number in order to put the money back in. She told him that she would not give him that information, and asked him what he had listed as her account number.He said he could not tell her that, and he told her that if she could not tell him her account number he would close her account. The member refused to give her account number, got off the phone, and called BECU. This man was not from BECU and was in fact a criminal attempting to gain account information. Should you receive a call like this, DO NOT give the caller your account number. BECU will never ask for your account number over the phone or in an email. If a member of BECU staff needs to verify your identity over the phone we may ask for a social security number, phone number, address, password, or other identifier. If you receive a call from an employee of BECU and have any doubt of its validity, get the name of the person you are speaking to, hang up, and call us directly at 423-336-7268 (or toll free at 866-285-4215) and ask for that individual. An employee of BECU recently received an email from “Fadella International”. The email claims that the recipient “might be interested in part-time position to work from home” with their company, and can make up to $4,000/ month to “facilitate financial transactions from the clients”. They ask the recipient to follow a link to complete an application – at which point your account information will be requested. Do not follow the links, and do not give your account information over the internet. A member brought in a cashiers check from Salyersville National Bank in KY that turned out to be fraudulent. The member was told that they would pay her $500 a month to put a decal on her vehicle for Twisted Tea. She was required to cash the check, keep $500 for herself and pay the rest to the person who would put the decal on the vehicle. It sounded suspicious so I called the bank and they reported this is one many fraudulent cashier checks they have had recently.